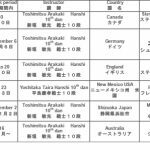 Sensei Arakaki Toshimitsu will be visiting Canada again from July 31st to August 6th, 2017. 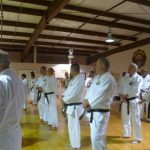 The classes and seminar will be hosted by Anshin dojo. Space is limited to 50 people.An attendance fee of $150 includes all classes that week and the seminar on Saturday and Sunday. Dan testing will be given on Saturday afternoon prior to the dinner party and will be for 1 st through 5 th dan (including 5 th dan). Dear WMKA members, I hope everything is well with you in your countries. We are always grateful for your support and cooperation with Okinawa headquarters. I was able to keep working as an overseas manager because of your help and support. At this time however, I reluctantly have to resign as current overseas manager and leave the WMKA. Follow links for registration, schedules and information for each seminar. 松林流空手道セミナー2015　in 海外&県外 Dear WMKA members I hope everything is well with your daily and karate life wherever you live. I want to thank you for your dedication and support of the WMKA. 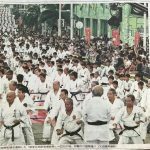 “The Memorial Karate-Do seminar & Exchange Demonstration 2014 for Soke Takayoshi Nagamine in Okinawa” was very successful because of your cooperation from around the world. Dear WMKA members from around the world, A Happy New Year! I congratulate you all in welcoming a bright and hopeful New Year 2015! We are very grateful for your strong support and cooperation for the “The Memorial Karate-Do Seminar and Exchange Demonstration 2014 for Soke Takayoshi Nagamine in Okinawa”. The events were great and successful. 宗家　長嶺高兆　追善空手道セミナー＆交流演武会２０１４in 沖縄 Dear WMKA members Merry Christmas 2014and A Happy New Year 2015 ! The event was great and successful because of your support and cooperation. Though, you may be enjoying it on facebook from many dojo owners who attend the events, I will add some news from Okinawa. We had more than 250 participants including spouses and parents of boys and girls from nine countries around the world. The two-day karate-do seminar was held on both October 31st & November 1 at the Okinawa Prefectural Martial arts hall in Naha City, Okinawa. We had a Dan promotion test, an “Exchange” demonstration and “Exchange” party on November 2, 2014. Please refer to the “Demonstration Program” for detailed information. I will send the program to all dojo owners who couldn’t come to Okinawa because of their health conditions or job situations. Okinawa Headquarters was very glad and happy to host the many WMKA members from overseas including mainland of Japan. I attached some Snapshot Photos during the events. The memorial photos of both Founder Shoshin Nagamine and Soke Takayoshi Nagamine with the WMKA flag and the Memorial events banner The Karate-do seminar was instructed by president Yoshitaka Taira hanshi 10th dan and other high ranking teachers. 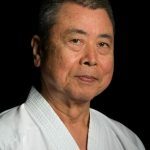 Yoshitaka Taira Sensei, 10th dan Hanshi, and president of the World Matsubayashi Ryu Karate-do Assosciation, was in Canada from July 24 through August 1st to officially open the Ryu Shin karate dojo. While in Canada, Taira Sensei also conducted a three day seminar. Here are the highlights of his visit.